Our last post detailed Alex’s port removal – no more safety blanket. The port hadn’t been used in a year or so and the MRI scans were good so the time seemed right to remove it. On Monday just gone the capricious whims of fate decided to prove us wrong. Phil received a call from Alex’s school, he had collapsed a few times and was suddenly talking gibberish. Phil’s amazing employers waved him goodbye and Phil took Alex to the Women’s and Children’s. Initially we thought this was something we had experienced before – a shunt malfunction – if the shunt pumps out too much fluid then the brain starts to press on the base of the skull causing some compression and leading to difficulty speaking etc. We expected a few scans, a shunt readjustment, an overnight for obs then home. The difference initally this time however, was that Alex no longer had an access port, so he had to have a canula in his arm instead. On the one hand, this was good, the nurses in ED are very experienced at putting canulas into little arms, but don’t have the same experience accessing ports. In the past ED accesses were fraught experiences. On the other hand Alex now had to tolerate a canula in his arm – complete with foam board under his arm and a bandage to secure it all. Phil didn’t elaborate completely about the circus which ensued but the look on his face told me it had not been a fun few hours. The other downside to having a canula in your arm is that once you are hooked up to a drip you can’t take your shirt off, so changing into his pj’s come bed time wasn’t possible. Alex had blood taken an X-ray of his shunt and a CT scan, which, courtesy of Daddy’s fast talking, was done without the need for sedation! The scans didn’t show any obvious issues so the boys were installed in the Kate Hill ward and settled down for a relaxing night of 2 hourly obs. Unfortunately Alex had another episode during the night – sitting up but unresponsive – even when the ipad was turned off! – then talking gibberish. Fortunately it didn’t last long and was witnessed by the nurses. Tuesday brought more tests, but no more episodes and a quieter night due to a room change (except when I brought Jenny to visit because the room was right next to the play area and she was having a great time playing in their toy kitchen). Wednesday morning and the neurosurgery team decided that since there had been no more episodes when Phil felt Alex was back to his usual self they could go. Phil decided to let Alex have a little play to see how he went before packing up, and was glad he did as Alex had another episode a half hour later, followed by gastro like symptoms. Unsurprisingly it was decided after that to get Alex into the MRI machine. The first estimate for a slot was put at 4pm, then pushed back to 5pm, then to 6. finally at 6.30pm Phil sang the rainbow song and Alex smelt the colours. Jenny and I arrived only a few minutes after Alex went in, so when Phil came back up from radiology we went with him for tea in the WCH cafe. Jenny was certainly very happy to see her daddy and much honking of noses and belly chuckles ensued. The MRI took longer than usual – a full 2 hours – and at 8.30 we got a call asking for one of us to head to recovery. Alex is usually pretty good coming out of anaesthesia, unless things are not as they were when he went under. Unfortunately for everyone, where the canula was sitting in his right arm was looking a little red so they removed it and put a new one in, but in his left hand. So when I went into recovery he was trying to pull it out, and it took a solid 45 minutes to calm him down and convince him that he couldn’t remove it and have it put back in his right arm. Initially when waking up Alex won’t let anyone touch or hold him. When you get him to the point where he will sit on your lap and cuddle you know you are past the worst, and thus it proved tonight. Once he consented to a cuddle with blankie and me I was able to ask him about his day, he very proudly told me about playing skittles in the toy room, and how he had knocked 10 of them over at once! A short walk back to the ward and he was very happy to see Daddy and Jenny, gave out lots of cuddles and kisses then settled in for a cuddle with Daddy. Fortunately I’d remembered to pack Jenny’s pyjamas and Phil had wrangled her into them by the time I got back with Alex. We left the boys at 9.30 (in another new room thanks to the gastro symptoms) with our fingers crossed for a quiet night for them. With luck we will get the MRI results early tomorrow morning, we will keep you posted! So it’s hard getting out of bed on Mondays at the best of times, but this Monday was harder than usual – the alarm went off at 5.45! Alex and I were headed into DOSA for 7am. Monday was Port Removal Day! We only had a week’s notice of the date, we were on the list of ‘non urgent’ surgeries so we were given a slot when one came up. The DOSA lists are organised by age – the younger you are the earlier you go. On Monday, Alex had the dubious honour of being the oldest and therefore the last on the list. We did all the paperwork, saw the surgeon and the anaesthetist, had his obs done and made the happy discovery that he has nearly cracked 16 kilos! (15.8kg to be exact) and settled in to wait. Alex was very patient and when we finally got the call at 11.15am he was super excited to smell the colours. Colours smelt and rainbow song sung, I left him in the capable hands of the surgical team and went to grab some lunch, and after about an hour and a half I headed up to wait in the day surgery area. Nine times out of ten Alex comes out of the anaesthesia really well, the tenth time is usually a big melt down. Usually this is triggered by something being on his person that wasn’t there when he went to sleep – usually a canula in his hand. This time I thought I might forestall this reaction by telling Alex that there might be a canula, and if there was to just very calmly say ‘excuse me nurse could you please take this out of my hand’. I also mentioned his t-shirt might be off and again to just calmly ask for it (while this might seem a bit odd that he’d be upset about a t-shirt, the one he was wearing is a bit of a special one with a googly eye on the front). According to the nurses, this was exactly what he did, beautifully calm and with lovely manners. Unfortunately I’d forgotten to warn him about the dressings he’d have over the wound sites, so at 12.57 guess who got called into recovery! It certainly wasn’t the worst melt down we have had in recovery, but it took a fair bit of fast talking to convince him that he couldn’t take the ‘bandaids’ off! The surgeon told me that the surgery went well, the cord was a very gunky – but that was expected after it had been in for 4 years – and that it had come out whole. One of the risks with this surgery was that the end of the tube could break off during the removal and they’d have to go fishing for it. The cord had become a little stuck during the surgery so a second incision was made in his neck to help with the removal. After Alex had calmed down, we had some stories and a bit to eat, then headed across the road to visit his friends over at little heroes. A big drink of milk and some cuddles and high fives later we headed back to the car and got home at 3.30. Since he was feeling a bit sore the next day he stayed home from school, but managed to get through the day without needing a nap and was well enough to head to school on Wednesday. Having the port removed is a big moment for us, (no more safety blanket!) but since we only knew a week out that it was happening we didn’t really have time to worry or stress about it. It feels like we are, hopefully, past the worst of what’s happened over the last 4 years, and the relief that feeling brings is wonderful. Unfortunately, the relief we feel is not universal. Some good friends of ours were very recently given an MS diagnosis. The sudden, out of the blue announcement that you have a serious medical condition which will now proceed to turn every single facet of your life upside down is horrendous. We have been there and it’s one of the worst things ever. So we want to send love and support their way, and the knowledge that once this horrible shock wears off, and it does eventually do so, things will get better, because the greatest of all gifts is hope. At the end of last year Alex had his grommets removed and his ears investigated, and a hole in each eardrum was discovered. 3 and a bit months on there has been some healing but not a great deal, his hearing is still very poor and Alex’s ENT doctor, Dr Michael, is of the opinion that the healing will take months, if it heals at all. There is a surgical option to fix eardrum holes, however it is not considered for children under 10, and even after that it’s on a case by case basis. We have been to see the lovely Kira at our local Australian Hearing office, and she has adjusted his hearing aids to match his current hearing loss, however, Alex can only wear his hearing aids if he does not have an ear infection. With gaping holes in both eardrums however, ear infections are currently just part of life. One thing Dr Michael did say was that even if the holes healed, we would probably be right back where we started from, with Alex having fluid build up behind his ears. 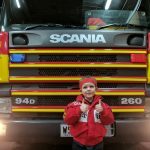 Because of the treatments he has had, Alex’s growth has been severely affected, he is currently about 25 cm shorter than ‘the average 7 year old boy’ and hasn’t really grown more than a cm or two in the last two years. Fluid behind the eardrum is a problem that children quite literally grow out of, and if he’s not growing Alex will still have issues. Dr Michael suggested we talk with Dr Ram our oncologist about getting Alex onto a growth hormone treatment regime, and this discussion has been organised for early April. Alex needed a port flush and a blood test so amid all the admission paperwork we got that done, and organised for him to have some catch up immunisations done immediately post scan (while he was still partially under the influence of the anaesthetic) which was more complicated than I first realised, but was achieved in the end with no problems. One of the things Alex hates is waking up from anaesthesia with something that wasn’t there when he went to sleep. The big one for him is the canula in the back of his hand. Phil and I always tell the nursing staff that they will need to take it out before he wakes up, or he will try and rip it out himself. Unfortunately, occasionally there is a medical reason they need to leave it in and invariably if this is the case, whoever is with him on the day will get called into recovery – usually parents wait in day surgery and their child is brought to them there. This time around the canula was left in and I got a phone call to go through into recovery to try and help calm him down. When Alex comes out of the anaesthetic he’s initially not really with it – just aware enough to realise he’s got something in his hand he doesn’t want there and he essentially goes bananas. The longer it’s left in the worse he gets, to a point where even if it’s removed he’s so upset he just looks for something else to be upset about. This time when I got there he was extremely worked up, the canula was still in, the nursing staff wanted to leave it in and consequently were having to physically restrain him from pulling it out. I had to do some fast explaining but I convinced them to remove it, Alex, however, was very worked up and then decided that he wanted the sides of the bed down. When he couldn’t have that, he decided he wanted to get off the bed, and he is still small enough that he fits in between the side bars on the beds! There was me, two nurses and an orderly all trying to catch him and hoist him back up through the bars and back on to the bed, and he didn’t want to have a bar of it! I ended up sitting on the bed and hugging Alex to me to get him to stay on the bed so they could wheel us down the corridor to day surgery. When we got there he had woken up enough that he was sort of listening to me, so I kept telling him he could have what he was after as long as he asked for it instead of just yelling. Shortly after that things were arranged to his satisfaction and I was able to sit him on my lap for a cuddle. Imogen who was the neurosurgery registrar on that day came into day surgery with a machine that looked like it had come straight off the set of star trek, which she used to reset Alex’s shunt. Usually a shunt reset would have been done in recovery, but her machine was acting up, and so was Alex, so we decided to try again in 10 minutes! With Alex calm and the machine working, the shunt reset was done in 2 minutes flat. Big cuddles, 300ml of milk and an hour later we were out of the hospital and on our way home. We collected Jenny on our way home (thanks Grandma & Grandpa!) and an hour or so after we arrived home I had a phone call from the duty doctor at the WCH – Dana. She rang to check on Alex as the results from the blood test had shown very low blood sugars, not unexpected given he’d been fasting, but she wanted to check and make sure he was ok and had eaten and drunk post procedure, which he had. Five minutes after that phone call Dana rang back. This time to tell me not to worry, they thought the blood sugar result was actually a false positive and oh by the way, the preliminary scan results were back. This was somewhat of a surprise, usually results take 2 – 4 days, and given it was the Friday before a long weekend we weren’t expecting results until Wednesday! The result she gave me was short and very very sweet – no new lesions and no change in the existing sites! We will probably get the official and more comprehensive results on Tuesday and a call from Dr Ram to discuss what comes next, but if everything is fine then in all likelihood Alex’s scans will be pushed out to every 6 months instead of every 4, and he will probably have surgery to have his infuser port removed. The removal of his port will be the removal of a big safety blanket for us. While it hasn’t been used in nearly 2 years, the fact that it’s there and we can use it if we need it has given us an odd sense of security. 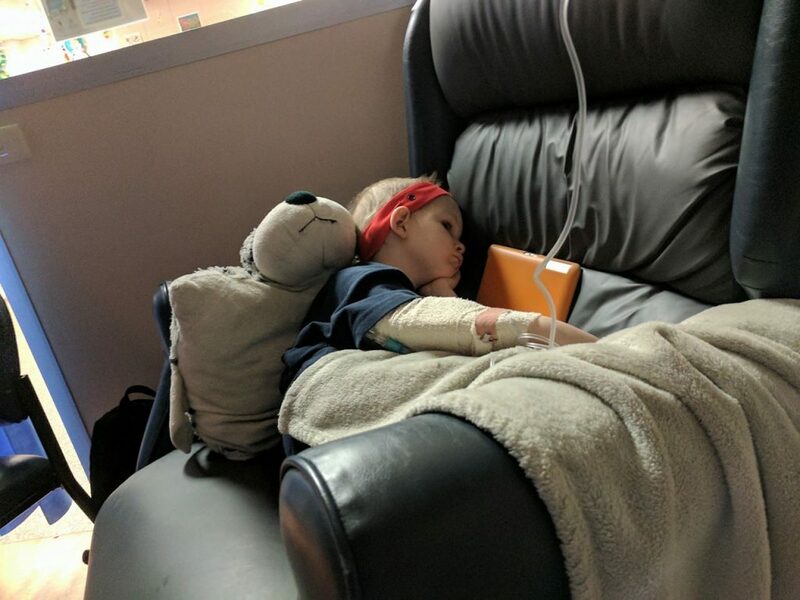 When Alex contracted rotavirus in 2015, because of his lack of immunity – thankyou chemo – he was very dehydrated, dangerously so. The hospital staff were able to hook up a drip via his port, which was something he was used to, rather than having to put a canula in the back of his hand, which, as I’ve said, he’s NOT a fan of. I don’t like throwing useful things away, I tend toward the ‘keeping it just in case’ frame of mind (something I’ve inherited from my Grancha according to Mum) and that ‘just in case’ has been why Alex has kept his port for so long – 4 years now. Alex finished chemo in July of 2013, but his port was left in ‘just in case’. We thought the chemo had worked, we only found it hadn’t 14 months after it had finished, and his port was needed for the next round of treatment. “what if it comes back again”. Saying he won’t need his port again feels a little like tempting fate. A cancer like leukaemia is an easier disease to declare, doctors can do a definitive test and say, “yes you have it” or “no you don’t”. Brain cancer is one which you just have to keep an eye on, the longer you go with no change the more confident you can be that you have probably beaten it, but there’s no definitive test, and no magic number of years for you to live post diagnosis and treatment that you can then confidently say “I’m cured”. I wish there was. So for now we will keep living from MRI to MRI, but with more confidence, and no more ‘just in case’.